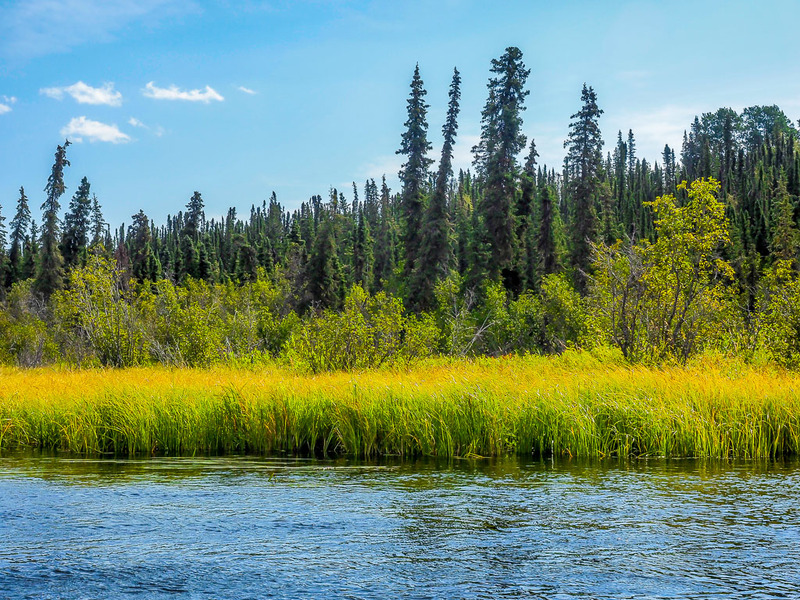 In the northwestern corner of Kenai National Wildlife Refuge there is a large wetland of lakes and rivers. Motorised vehicles are not allowed so canoe or kayak is your best bet to explore this part of the refuge. 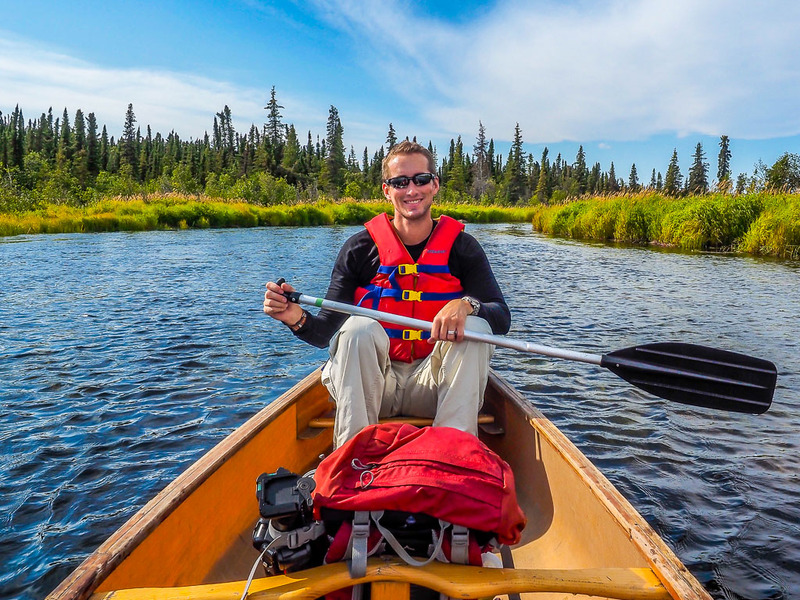 The Swan Lake and Swanson River canoe routes is a combined network of more than 100 miles and you can spend days enjoying the wetland. 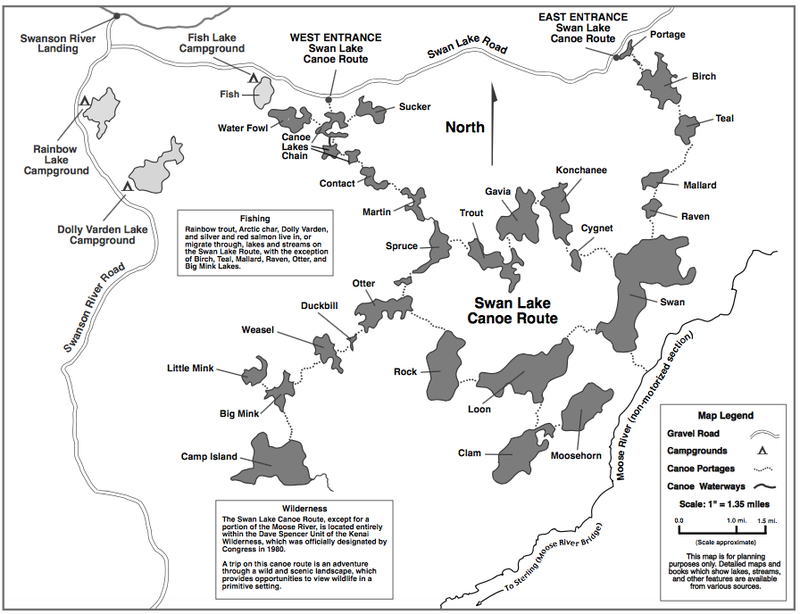 The northern network is a combinations of the Swanson River and lakes, while the western network is not connected to the river and is a network of lakes only. There are multiple entrances into the waters from both networks and we had set our mind on what was called ‘the west entrance’. We were quipped for a day out canoeing and decided to try our luck on Swanson River instead. The road down to Swanson River Landing was open and had easy access to land a canoe on the river bank. From this landing you can reach the upper network of lakes, but that would be more than what we could chew over for a day trip. 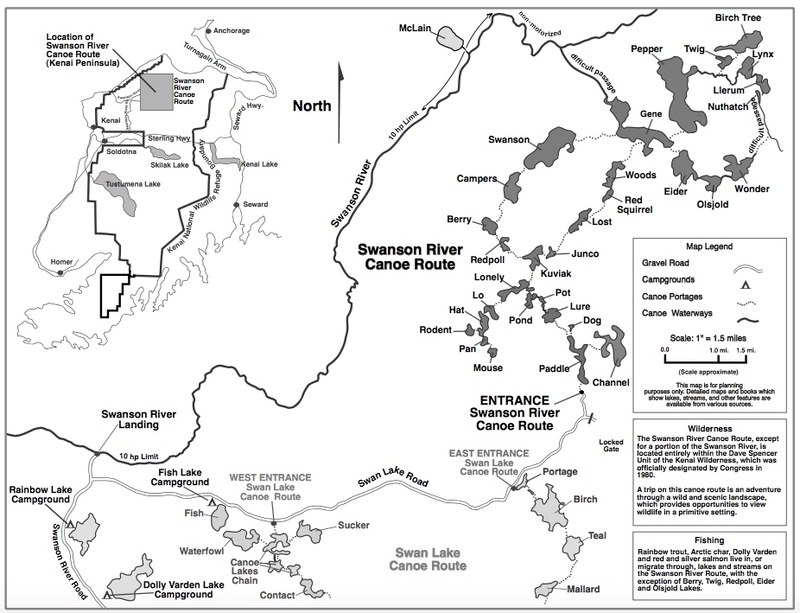 The two maps below of the Swanson River and Swan Lake Canoe Routes gives a good impression of how large this area is. Canoeists must register at the entrance where they embark and we found a registration box at the landing. While carrying the canoe to the river we met a very chatty guy and learned he was travelling around Alaska with his RV. He also said he had lived on road kill and salmon the last 14 days. At that time we figured it was time to set up the river and politely said goodbye to this interesting gentleman. It didn’t take long before I regret not bringing a fishing rod. Fish was frequently jumping in the river and the water was very clear so sometimes I was able to spot them swimming as well. Turns out the Swanson river system supports a large population of game fish like silver salmon, rainbow trout and Dolly Varden. Well, they would all be safe today. Kenai National Wildlife Refuge was first established as the Kenai National Moose Range in 1941 to protect moose. In 1980, the Alaska National Interest Lands Conservation Act (ANILCA) changed the name and purpose of the refuge. The refuge now exists to protect wildlife populations and the variety of habitats they need to survive. The area around the river was basically wetland and finding a spot to land the canoe was a challenge. Despite not seeing the birds in the tall grass we could definitely hear them as their singing accompanied us throughout the paddle. 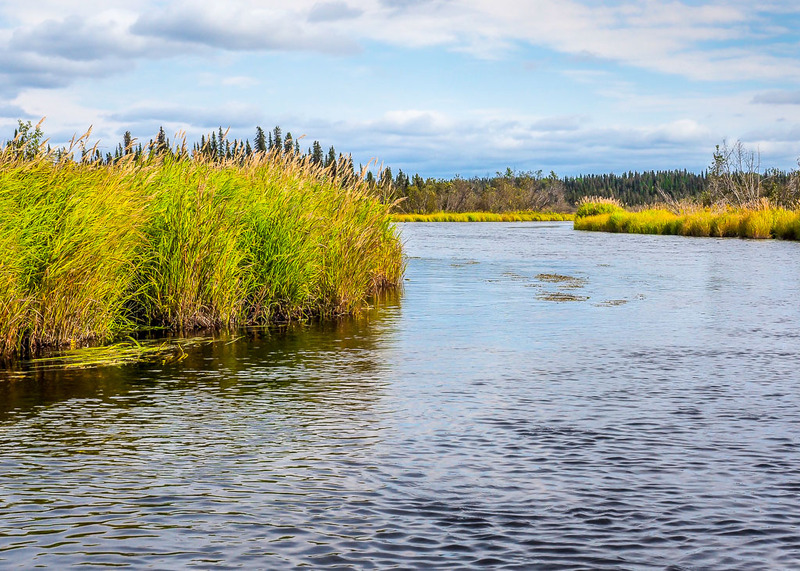 Bogs, marshes, and muskeg are nesting areas for migratory waterfowl and shorebirds. These birds depend on the abundant insect life found in summer wetlands to feed their young. 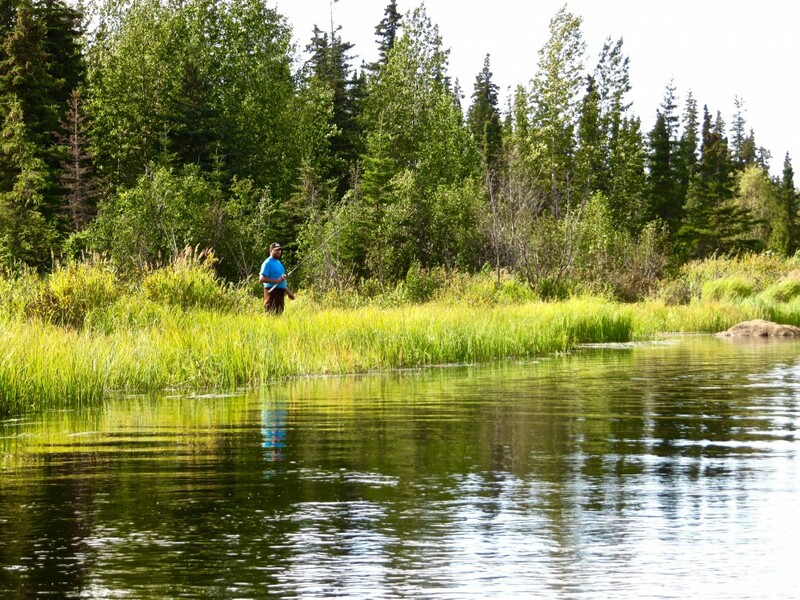 Areas around rivers, lakes, and ponds are home to beaver, muskrat, loons, trumpeter swans, and spawning salmon. The river was calm and fairly easy to navigate except for some larger rocks we had to navigate around. Tall grass covered the banks on each side of the river, you never knew what was around the next corner. Hopefully not a bear! It felt like we were in an episode of Indiana Jones. Unfortunately the tall grass blocked any view of possible wildlife. 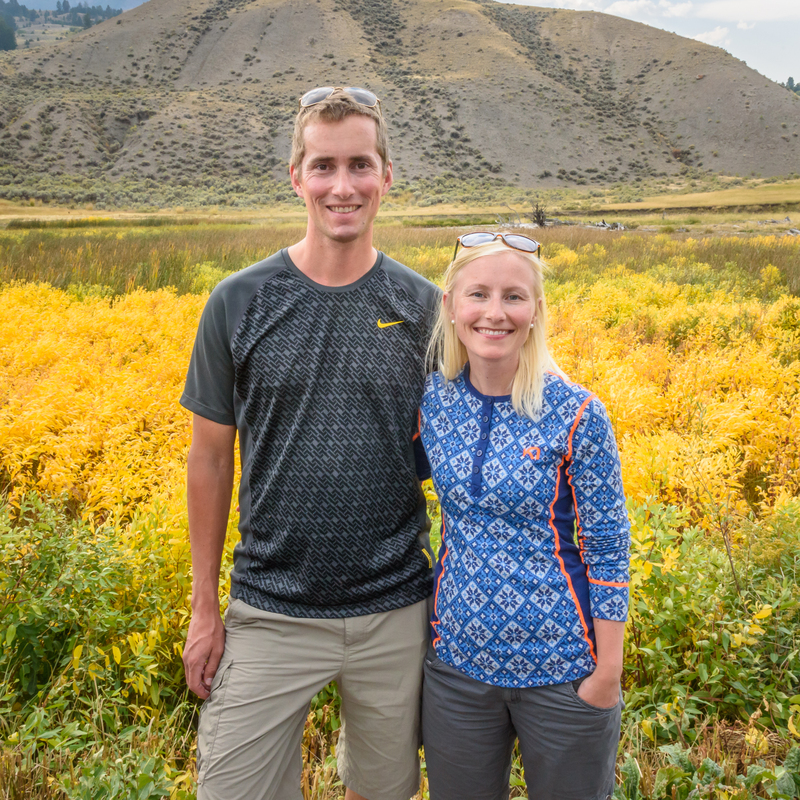 We were hoping to spot a moose or two as the wetlands of Kenai Peninsula is supposedly the ideal habitat for them. 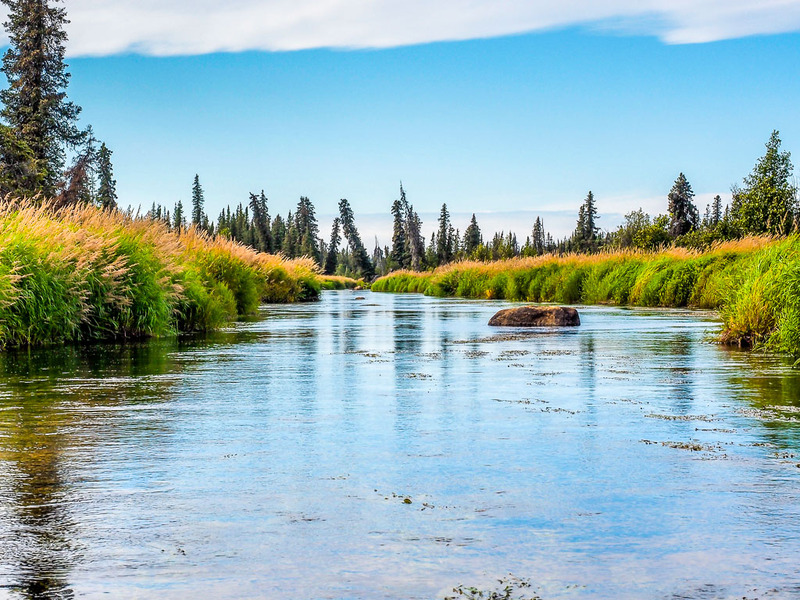 Did you know the moose spend a great deal of time wading and swimming in lakes and ponds, foraging for tender aquatic plants such as horsetail, sedge, and pondweed. They will even submerge completely to get at a particularly tasty mouthful. Getting back to Swanson River Landing we found several fishermen along the banks, so maybe those salmons wouldn’t be that safe after all! This was the only moose we spotted this day. Thanks for stopping by, your comments are much appreciated. Thanks Janet! It was such a lovely spot for canoeing. I was also happy we didn’t see any bears! That moose was my favourite as well..hehe:) Thanks for stopping by! What adventures in perspective …. thank you for sharing the photos are very beautiful. Thank you Hervé! It was a delight to canoe this area. Very beautiful scenery. Thanks for your sweet comment! Looks so scenic 🙂 Must be fun to canoe in the beautiful surroundings. It was very scenic, and the best part was that it was so quiet and untouched by humans. A lovely day out paddling. Thanks for stopping by! An ‘interesting gentleman’ but no diving moose today? A beautiful place. I tried kayaking for the first time this year in New Zealand and the calm river looks like something I could handle 😀 And wow, I didn’t know that moose is willing to go into water and even submerge, that’s crazy! I was also surprised to learn that moose would dive to find food. Would love to see that some day. You would definitely not have any problems kayaking this river. There was only a couple of stops that was a bit narrow where we had to navigate around some rocks, nothing too advanced. Kayaking in NZ must have been pretty awesome? It is such an amazing country with stunning scenery! The passages look so relaxing and calm. What a great trip but maybe you should have tried out the road kill. Lol. Thanks Frank – and thanks for stopping by! Hope you went fishing there too. I can hear the mosquitos as I type. 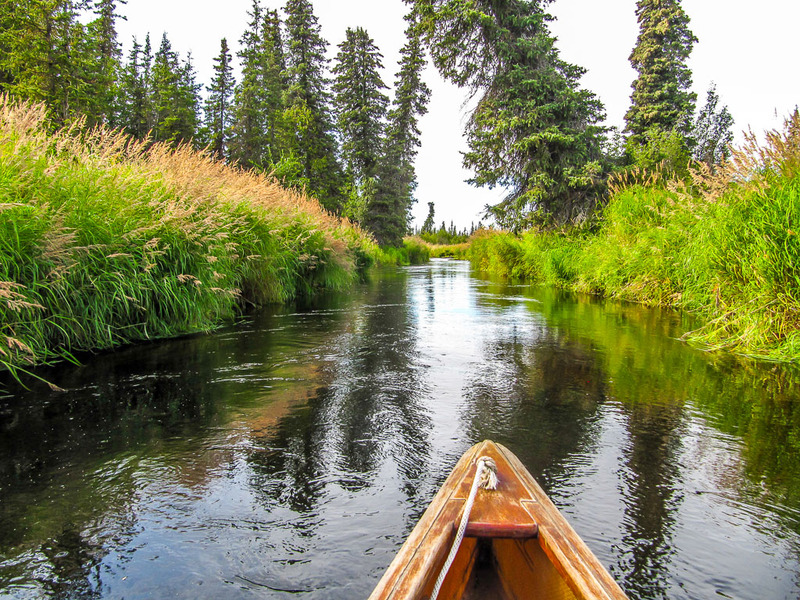 Thanks Jim – we had a relaxing day paddling this beautiful scenery. Only the moose was missing! What a beautiful place to explore. Loved the bit about the guy who lived on fish and roadkill too, well by the sound of it it did him no harm. beautiful river! serene and scenic! Thank you! It was lovely to paddle through this area. We didn’t meet a single person and it seemed so untouched by humans. Thank you so much! Lovely and relaxing day out on this scenic paddle. Only the moose was missing! Beautiful river. I can imagine it was a very peaceful and relaxing adventure. 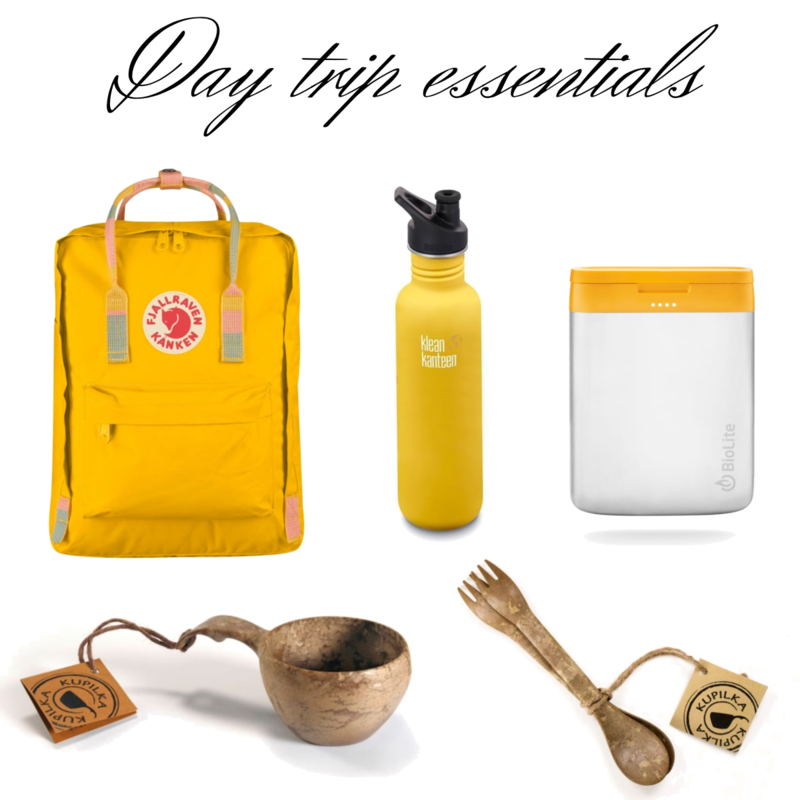 Another great adventure! That guy you met does sound a little scary – good thing you moved on. Thank you! I am also happy we didn’t encounter any bears. The river was a bit more narrow than I had expected in some locations and with the tall grass we wouldn’t have seen the bear before we were too close. Thanks for stopping by. Great entry, thanks for sharing. If you put in at Swanson River Landing, where did you take out? We’re thinking of doing the Swanson River Canoe Route to the River in two weeks, but I didn’t know about the road work so we’ll have to check on that! Thank you so much for you sweet comment – we really enjoyed this relaxing day in such a serene, beautiful surroundings. Thanks for stopping by! Thank you! It definitely felt like an Indiana Jones moment:) It definitely makes a travel memorable. Glad you some of them in Argentina! The road block just made the trip a bit unpredictable, but no less fun! Thanks for stopping by, your comments are always much appreciated! Fantastic adventure, thanks for taking us along, Inger. That rock in the water really looks like a bear! Also liked hearing about the RV traveler who had been eating salmon and ROADKILL for two weeks. hilarious. Alaska is full of characters like that. Thanks Jet! I thought the roadkill guy was quite an Alaska icon as well, encounters like that are so fun:) Thank you so much for stopping by! It was the perfect spot for paddling, nice and calm waters full of fish! You guys have so much to look forward to. Thanks for stopping by LuAnn. It seems like a perfect, tranquil way to spend a day ~ a moose in the river sure would have changed the mood 🙂 Beautiful photos, as is expected with you, and I like your thoughts of wishing to have a fishing rod…when I see fish swimming below in clear water I either want to fish or jump in and swim with them! Thanks Randall. It would sure have been nice to see a moose in these areas since it was supposedly many of them around, but we did see one later on (evidence presented in last post). Despite no moose and no fishing it was such an enjoyable day. Thanks for stopping by! I also didn’t know about that before our Alaska trip. I read somewhere that the greens under water carry a lot of sodium which the moose doesn’t get enough of from the greens in the forest, so that might be why? Thanks for stopping by! Yeah, it could be ! It makes sense ! What a lovely area – but shame you didn’t see any moose. It sure was a shame we didn’t see a moose, but no worries, we saw one crossing the river with its calf just a few days later! That made my day. Must be a spectacular adventure , your photos are stunning! Waiting for your announced next post…. What will it be about…? Love, love , love this post! Thank you so much for you generous comment – very much appreciated! It was such a lovely day on Swanson river, Alaska has so much to offer:) An amazing place. Thanks for stopping by! 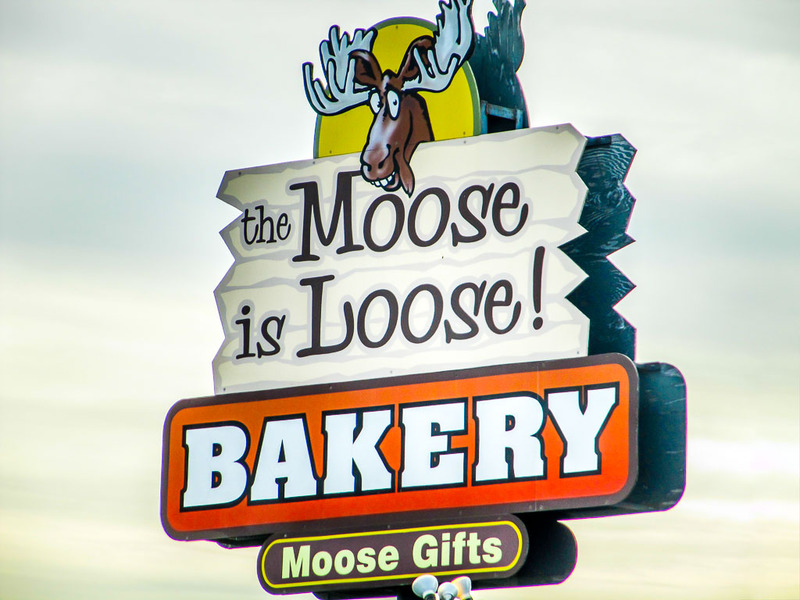 I thought the ‘moose is loose sign’ was so cute I just had to have a picture of it. Very Alaska! 🙂 Thanks for taking the time to leave a comment. Fish was frequently jumping in the river — what a beautiful river to cruise through. So fun to paddle in a river where fish is jumping. I was so excited:) Thanks for stopping by! Thank you. It was perfect for a little paddle:) Thanks for commenting!